The CBOE Volatility Index: A Fly In The Ointment? Amid a shift away from fixed income investments and toward equities, and with a smattering of year-end “window dressing”, the S&P 500 Index has been edging closer to a test of key trend line resistance near the 1,280 area. Fostered by this change in investment preference, it is also worth pointing out that the CBOE S&P 500 Volatility Index (VIX), which has been steadily declining for months, is now approaching a test of dual trend line support located at the $15 level. 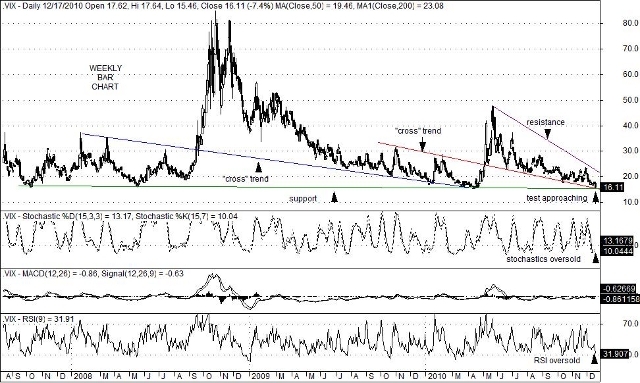 With oversold conditions present on weekly charts, this set-up suggests that the decline in the VIX, which originated last May, could be coming to an end soon. It is also worth noting that the last time the VIX reached this area of support was last April when the S&P 500 Index itself hit an intermediate-term high of 1,219.80. Afterwards, the S&P 500 Index declined by almost 209 points, or 17% until it reached the 1,010.91 level on July 1st. The current technical set-up on the VIX, is at the very least, a “heads up” that the S&P 500 index may find it difficult to cross solidly above the 1,280 area on its first attempt. Instead, a solid correction phase in equity prices could result. That said, the economy has been slowly improving over the past few months. Another big plus was the passage of a massive compromise fiscal stimulus package that was just signed into law. That passage should help the economy to continue to strengthen over the intermediate term. Still, battles over how to pay for this out-sized plan could cause unease in the investment community in the months just ahead. This entry was posted on Monday, December 20th, 2010 at 2:09 pm	and is filed under CBOE Volatility Index (VIX). You can follow any responses to this entry through the RSS 2.0 feed. You can leave a response, or trackback from your own site.